Hurricane Preparedness Week is May 26 through June 1, following the release of the official forecast for the 2013 Atlantic hurricane season. This week, USAID is highlighting the work we do to help disaster-prone countries prepare for and recover from hurricanes. There is a place in Miami, Florida, where deadly, hurricane force winds can be felt year-round without the threat of destruction. In fact, it’s a place that’s being used to help save lives. It’s called the Wall of Wind, a cutting-edge lab at Florida International University (FIU) that can simulate hurricane conditions using 12 giant fans, stacked two high, capable of generating winds with speeds exceeding 150 miles per hour, packing the punch of a Category Five storm. USAID’s Office of U.S. Foreign Disaster Assistance is working with FIU to harness these hurricane force winds to test the strength and design of transitional shelters. Transitional shelters are not tents, but they’re not quite houses, either. They are a mix of the two, constructed using new and salvaged building materials to safely house people who’ve been hit hard by disasters until they secure a permanent home. Hurricanes can be catastrophic, uprooting communities, taking out entire coastlines, and killing thousands of people in the process. Flying debris—often from pieces of roofs and homes—contributes to being one of the most deadly and destructive side effects of these storms. This is why it’s crucial that transitional shelters are strong enough to withstand nature’s worst, and that is where the Wall of Wind comes into play. Take a look at the video, and see for yourself if a transitional shelter constructed with USAID-identified best practices could really stand up to a hurricane. The transitional shelter was blasted by wind speeds of more than 100 miles per hour—well in excess of a Category One hurricane—and remained standing. USAID’s work with the Wall of Wind not only helps improve the quality of emergency shelters, it can also have a real impact on the way future homes and businesses are built in hurricane-prone areas. Having seen & involved reconstruction process in Haiti for the last 3 years i think this is a great move where the weather conditions are worst with hurricanes and floods and land slides. My view is lot of NGOS and INGOs wasted millions of doallars by provided transitional shelter with very low quality and no design which were destroyed for the first heavy weather conditions in september 2010. It would have been good if they provided with T-shelters like these which are tested and grounded well in the base. I have been involved in construction of 3000 T-shelters and we are happy that they are still standing perfect and will sustain another 10 years. some of them are funded by OFDA. 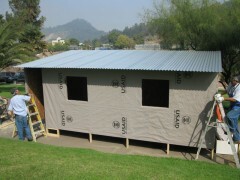 Ofcourse this took some patience and cost to provide these shelters. Out shelter costed around $4500 which is on the higher side.